Karin, a young woman from the Baltic countries, marries fisherman Antonio to escape from a prison camp. But she cannot get used to the tough life in Antonio's volcano-threatened village, Stromboli. A wealthy woman becomes obsessed with humanitarianism when her young son dies after committing suicide. An unhappily married couple attempts to find direction and insight while vacationing in Naples. Irene Wagner, the wife of prominent scientist Albert Wagner, finds herself blackmailed about her affair by her lover's jealous ex-girlfriend. The plot, an experiment in causing fear, drives her into a rage. A young German boy faces the problems of the tough life in the immediate post WWII Berlin. A series of vignettes depicting the lives of the original Franciscan monks, including their leader and the bumbling Ginepro. In the first episode, a heartbroken woman talks to her ex-lover on the phone. In the second, a pregnant woman believes she is carrying the child of Saint Joseph. Bardone, a petty con man, is arrested by the Gestapo and coerced into impersonating a partisan leader in order to expose another resistance organizer. Five portraits of actresses in their "common" life, seen as women rather than movie stars. Paola, a Milan call girl, returns home to her village in an attempt to go straight. Rejected by her father, blackmailed by a former lover, and lusted after by her brother-in-law, she turns to her beloved sister for support. Old Man #1: Volcano is a very dangerous. Sometime blow up and a lot of stones go up and come down right in floor and make big hole and burn everything. Like in 1944. Karin: Why did you leave America? Old Man #1: I leave America. America's good for young fellows. I am old man and I come back to Stromboli. Old Man #2: This fellow too old and stupid in the head. I don't want to die here. I want to go back over to my son in Brooklyn. And he saves money for my trip. I am going back in Brooklyn in about ten years. Karin: How old are you? Q: World Premiere Happened When & Where? Rossellini's "Stromboli, terra di Dio" is a film on the line between fiction and reality more than usual for the acclaimed director. 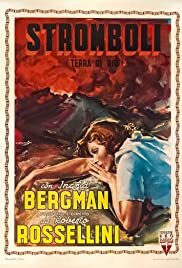 Most of the central part, where Karin just lives in Stromboli and complains about stuff was not written as in a normal screenplay: Rossellini chose possible elements of the environment or popular habits and filmed them in the movie, putting Karen in it like an extrernal observator. This has a double effect: neorealism comes to some of its highest achievements (like the tuna fishing and the eruption of the volcano) but to the loss of a fantastic actress such as Ingrid Bergman, who always feels out of place. Careful: I didn't say KAREN, I said BERGMAN. Because as a character she should be out of place, and she is even esthetically: she's always combed and white as the moon, while the inhabitants are rusty and dirty. But the actress herself is out of place in this film, and that is not a good thing at all. Her lines are dumb, repetitive, and Bergman actually did a great job managing to not disappear in such irrelevance. She still lives the scene, but her attempt is clearly forced into a new, uncharted territory as was Italian filmmaking for an American diva. We could say then that Ingrid is just as lost as her character. What I just can't stand in this film is the necessity of squeezing the religious conversion (I'm talking about the Italian version of the film, American and International versions have slightly different endings for that time's commercial policies). It was the result of Rossellini's collaboration with powerful politicians and Church men, to be specific Giulio Andreotti and Felix Morlion, whose intention was to use a critically acclaimed author's cinema for political propaganda. I hate when other interests interfere with artistic purposes, and here the last moments are definitely flawed with an out of the blue realization of the power and existence of God for no good reason. As I said before, neorealist features are what makes this film enjoyable and a classic. Apart from the brilliant scenes I mentioned above, I really liked the harsh depiction of the patriarchy that unfortunately still exists and thrives especially in the South of Italy. I actually felt bad and angry at Antonio as he jerks his wife with no respect and beats her like an animal, but I know very well that even today that is the norm in so many families and that simply pisses me off. Kudos to Rossellini for depicting that so realistically, but then again he's a great director exactly because of scenes like those.